The deployment of distributed component-based applications is a complex task. Proposed solutions are often centralized, which excludes their use for the deployment of large-scale applications. Besides, these solutions do often not take into account the functional constraints, i.e. 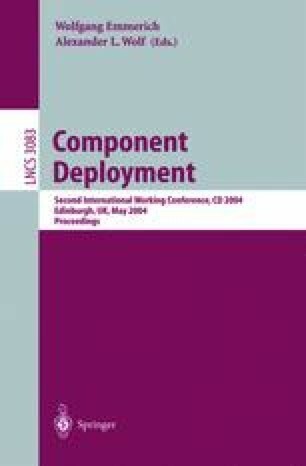 the dependences between component activations. Finally, most of them are not fault-tolerant. In this paper, we propose a deployment application that deals with these three problems. It is hierarchical, which is a necessary feature to guarantee scalability. Moreover, it is designed as a distributed workflow decomposed into tasks executing asynchronously, which allows an “as soon as possible” activation of deployed components. Finally, the proposed deployment application is fault-tolerant. This is achieved by the use of persistent agents with atomic execution. This deployment application has been tested and performance measurements show that it is scalable.